Disney's very loose remake of its 1977 live-action/animation hybrid might be the sweet surprise few saw coming this summer. The original hardly demanded a revisit; child-meets-CGI-creature features have been well covered (The Jungle Book, The BFG); the director, David Lowery, is an outside bet for a family movie. And yet Lowery, whose last film was Terrence Malick-ian crime slow-burner Ain't Them Bodies Saints (2013), brings characterful restraint to this genial fable of grief and growth pains, which he co-wrote with Toby Halbrooks. Instead of straining to modernise the tale or weaponise the schmaltz, he utilises old-school charm and a timeless sense of place. It's immediately captivating, with a daringly dark opening in which five-year-old Pete (a likable Oakes Fegley) is orphaned, lost in dense woodland and taken under a puppy-ish dragon's wing. 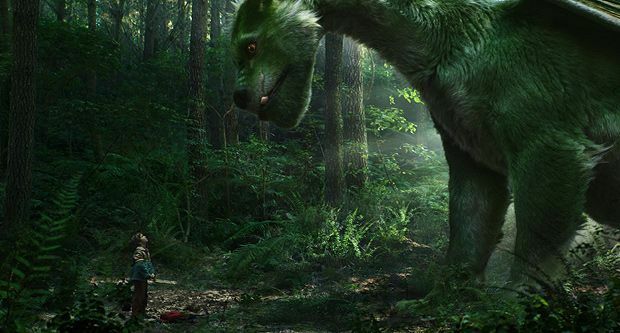 That early dragon reveal proves a smart move; aided by the woodsy surrounds, Lowery naturalises the CGI so as to focus us on the tender boy/beast chemistry. Despite that sweet bond, sentiment is kept in check. As Grace, the forest ranger who discovers a now Mowgli-ish Pete five years on and offers him a new life, Bryce Dallas Howard balances moist-eyed warmth with a no-nonsense streak. Robert Redford, meanwhile, resists overdoing the twinkle as Grace's dad, a wood-carver with a shed-full of homespun homilies. This gentle touch extends to Elliot the dragon, an endearingly klutzy creature. He gets one Game Of Thrones-y moment battling Karl Urban's perfunctory villain – who fancies capturing a dragon – but the action-packed climax never suffocates the bruised intimacies of Pete and Elliot's friendship. With that balance of heart and high adventure, the final grace notes of this unusually modest tentpole prove unusually well-earned. Factor in some pleasingly non-Disney-esque soundtrack choices (Leonard Cohen, alt-folk rascal Will Oldham) and you've got a distinctly gentle charmer; a welcome children's option in a summer not short on noisy known quantities. General release from Friday 12 Aug.
Forest ranger Grace (Howard) discovers orphaned Pete (Fegley), who has lived in the woods for six years with a mysterious dragon named Elliott. Lowery uses old-school charm and a sense of place to make a genial fable of grief and growth pains; one of the best kids' movies of the summer.